The murti is compared to a post box that is authorised to accept mail on behalf of the central post office. As most people live far from a central sorting office, the post office installs local boxes. Similarly, though most people cannot approach God in his abode, he appears as the murti before those who sincerely desire to serve him. We cannot put mail in any box; it must be authorised. Each box is made and installed under the authority of the post office. Similarly, sacred images should be made and worshipped only under scriptural guidance. Though the murti is perceivable to our senses, Hindus consider it Brahman (spirit). Hindu thinkers differentiate between matter and spirit, but on a higher level consider both to be Brahman. God can change matter into spirit and spirit into matter. He is compared to an expert electrician who can use electricity to refrigerate and to heat. Though people in ignorance cannot perceive spirit (and hence God), the Lord may agree to appear before them in a visible form so that they can develop their relationship with him. The murti, though appearing to be matter, may function as spirit. What experience do we have of practices that resemble deity worship? Why do we build statues of famous people or keep pictures of the deceased (whose graves we may venerate)? Many branches of Hinduism do not agree. Both practically and theologically, the murti may be considered to be God or the specific deity it represents. Some Hindu groups consider the murti a form of avatar. The question of idolatry naturally arises for many non-Hindus encountering image-worship. 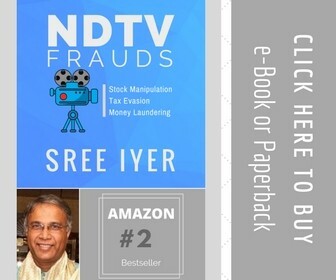 It is especially relevant in schools where teachers and pupils are predominantly Christian or of other religions that have reservations about idol-worship, or practices that resemble it. The more developed strands of Hinduism have sophisticated theologies which differentiate between (what they consider) genuine deity worship and that which is unacceptable (or on a lower level of understanding). Naturally, they reject apparently similar practices focussing on demonic forces and which are influenced by the quality of ignorance (tamas). Deity worship should be performed in goodness, and there are strict rules regarding its scientific execution and the character and conduct of those performing it. 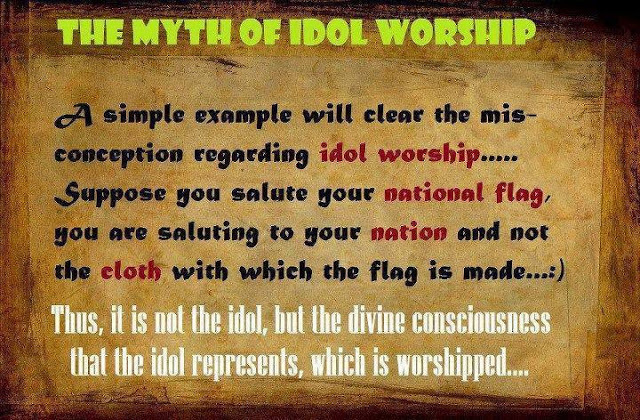 To all the People who point us at Idol Worshipping ! And to all the hateful messages by some Muslims saying about our Idol Worshipping, This is the answer ! idols, not worshipping idols, just believing in god and doing the good work, by meditation, by jap, by tap. And many more, in Sanathan Dharma you are not bounded, it's the first and oldest in the world, it has given everything to the world, the music in form of "Shastriya-Sangeet" which means derived from the shastra, Theatre from Natya-Shastra, Astrology & Astronomy Jyotish-Shastra & Khagol Vigyaan, Vaastu From Vaastu-Shastra, Economics From Arth-Shastra, Meditation - Yoga, Surgery from Sukshut-Samhita, medicine from Ayur-Veda. Aryabhatt invented Zero, And Vedic maths also given by us, and which religion or dharma prays for all in this world even plants and herbs. And many more even I'm unable to tell, just have faith in your dharma respect all but at least oppose when someone insults your dharma and remember when the world was roaming with no clothes on then in the darkness the sun of knowledge was shining upon us as we had everything one could need.